I’ve thought about, and more than slightly dreaded, writing this post for a few weeks now. What first came to my mind about this year was the negatives, because there have been more than a few. I’ve had more jobs this year than I wanted to, I’ve seen both the best and the worst in people and I’ve struggled myself. That said, when I was driving on Christmas Day, I realised I felt content. Let me explain. This time last year we were living at Ali’s Mums, I’d just started a new job that I wasn’t happy in and all in all I was quite low. In 12 months so much has changed for me and Ali. We’re in our own place, which was so special, we’re both working in jobs that we feel good at and enjoy and we’re happy. I’ve realised I can survive Ali being away for months at a time, and we can still get through tough times apart (I lost my job when he’d started the second month of tour, not great timing). I’ve definitely seen the best and the worst of people this year, but through it, all learnt that I have some wonderful friends and that my family will always support me. When I was going through awful times this year, job hunting, going through the pain of spinal injections, losing Hamski and just feeling lost, I had people around me who cared. Even though all that happened I fought my way through. For so long I’d thought, great, the ‘real world’ is about hating your job and being miserable. Thankfully, and while I never take any job for granted, I’ve actually found that I have so much passion working in Social Media, something I’ve wanted to do since I was a student. I’ve realised that if I’m in pain I can go back to the doctors and be firm with the help I need. I’ve learnt that, when I have to, I can survive on just texts and phone calls with Ali, even at the worst of times. That doesn’t mean that I haven’t had a great time too! I’ve been to Pride in Brighton, got published in a magazine, went on holiday, fallen in love with another little hamster and grown my blog more than I thought I would. So, while 2017 might not have been the easiest, it’s shown me that I’m resilient and you know what, sometimes, I’m pretty damn cool too. Blogmas Day 17: Our Little Christmas Tree! I was very excited at the prospect of getting our first Christmas tree. Ali took a little bit of persuading, we live in quite a small flat and he can be a grumpy Grinch! I told him before he went away for work I was planning on getting a small tree…it was there when he came back, whoops! Our tree is only tiny, 4ft tall to be exact so I’ve managed to find a little home for it! I wanted to share with you some of the lovely ornaments on our tree this year because I’m super proud of them. Also, most of these are from Sainsbury’s because they knocked it out of the park when it came to Christmas this year. He is so cute and Robins just remind me of winter and Christmas, he was around £4 too and he’s actually quite heavy! Ok, I’ll admit, the tree has a slight woodland creature vibe going because I love them. This is probably the cheapest ornament from The Range and cost around £2. He’s absolutely adorable and covered in fake snow. I wanted to get this bauble because it will remind us of the first Christmas we spent in our own home. This is so adorable and to make it even cute it’s actually a bell! Plus can you really have a good tree without some reindeer magic? I don’t think so. This was a gift from my Mum to both of us so that we could pop Wickett on the tree too! This was such a cute and thoughtful gift, it has pride of place on the tree. Another gift! My Dad surprised me with these, I hadn’t even seen them! I absolutely love Harry Potter as my regular readers will know! These look fab on the tree, especially as they’ve been decorating my bookshelves since I was given them! If you follow me on any social media you will know that I LOVE hamsters. I’ve had 3 dwarf hamsters and 1 Syrian in my life. 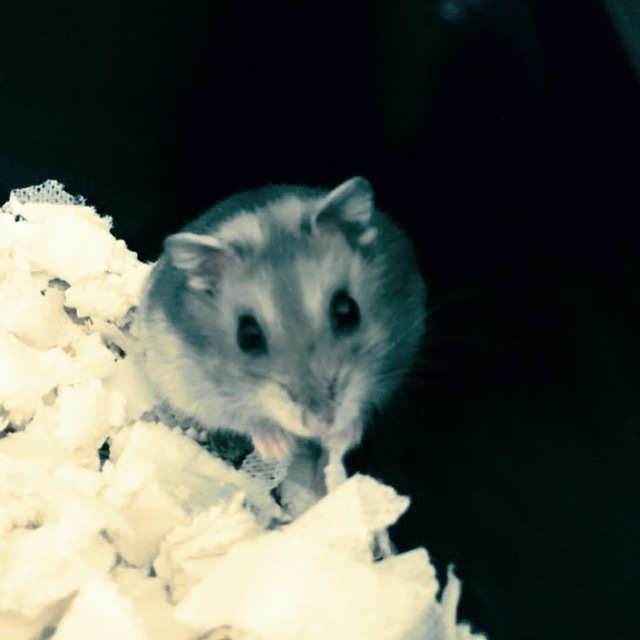 I just find them to be loving, adorable and ah I can’t get enough of hamsters. So, here’s some reasons why hamsters are the best. For such tiny creatures, they all have their own personalities that are so different. I’ve not had two hamsters the same and I doubt I ever will. Food, Water, Sawdust and a reasonable cage and you’re ready to go. Exercise is also pretty easy, a wheel and an exercise ball is plenty! Watching a hamster run around in their ball or on a wheel is fun! They get so excited by the simplest things. All of my hamsters have had their own way of being affectionate from curling up in your hair, on your shoulders, dragging your hand to make a slide, or playing hide and seek. Like with most pets, they won’t judge just love and sometimes that’s all you need. After months and months of me begging, pestering and pleading with Ali I finally got a yes. Not to a wedding proposal, to something much cooler. 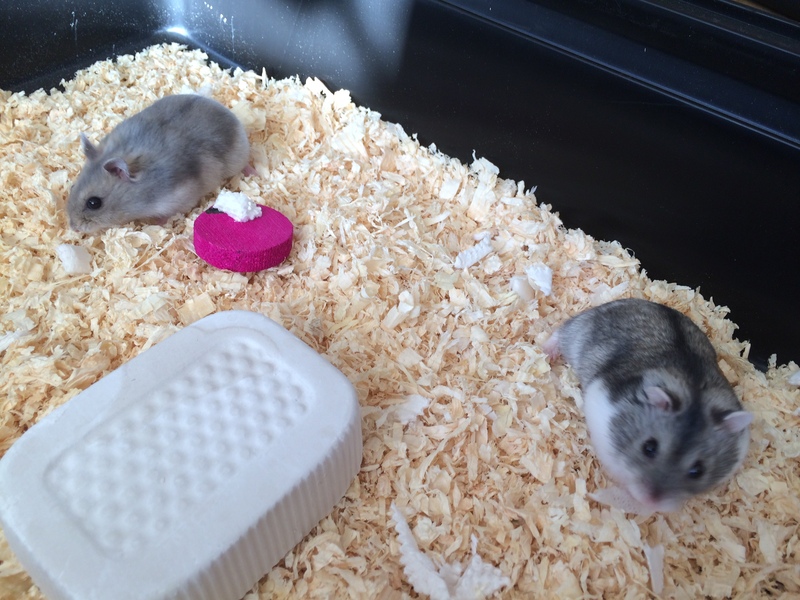 I would like to announce the adoption of Noodle and Hamski, my two Russian Dwarf hamsters. 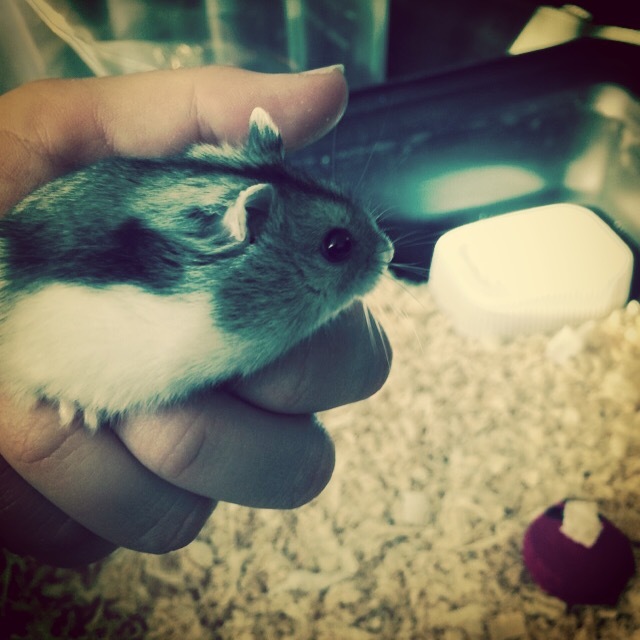 Some people announce babies…I announce hamsters. Ali and I have joked about having hamsters for years and calling them Noodle and Hamski, I don’t even remember how that started! We’d had a few discussions for the last year about them and I always got told no,no,no. As soon as he changed his mind I was in a car and down to Wimbledon to pick out my two. Initially I chose the other two but as I put my hand in for them to sniff it was Hamski who came up to me so there was one. The other two kept running away and although Noodle was pretty nervous, eventually I got my second. That’s what I do with animals, if there is more than one I let them choose me, it was exactly the same with Lottie she licked my hand and she was ours for keeps. They’re lovely little things and already have their own personalities, Hamski is braver and more friendly, Noodle runs like a mad thing but doesn’t like humans that much…apart from Ali for some reason. That said in the car Hamski would not stop making noise and scratching at the boxes, I think that one is going to be trouble. I’m so excited and you can all expect to see lots more hamster updates soon! !